Every so often, we like to examine the production of Tallahassee Realtors in order to forecast industry employment changes in the coming year. Unlike many industries where the overall market production is an estimate at best, the home selling industry is far easier to track. We merely need to measure production through two separate reporting agencies (in our case, the Tallahassee MLS and the Leon County Property Appraisers Office), and then make a few comparisons. As I happen to be married to a Realtor in Tallahassee, I'm am excited to report that the average home selling production is on the rise and has reached 6 home sales per person, the highest it has been since November 2006. The first comparison I like to check is my estimate of consumer confidence. 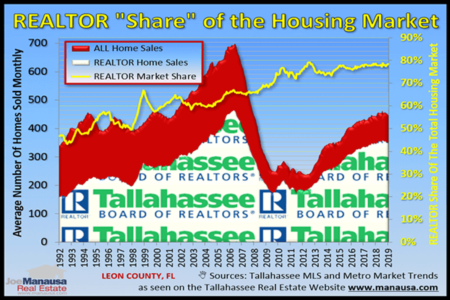 The real estate graph below measures the total number of homes being sold in Tallahassee each month (red area) as well as the number of homes being sold by Realtors. The "Realtor Share" of the market is shown as a yellow line and recorded on the right vertical axis. Here is what we are seeing above. The yellow line shows that 77% of all home sales recorded with the Leon County Property Appraiser also appear in the Tallahassee MLS. Simply put, this means the Realtors are involved with at least 77% of all home sales (Realtors are not required to put home sales in the MLS, so if they sell a house prior to the beginning of marketing, it is possible it will never be entered into the MLS). The reason that I refer to this as the consumer confidence estimator is because Realtors sell more of the homes when the market gets tougher (for sellers) and less of the homes when the market gets easier. Look at the spike in the yellow line in 2007 when the market plummeted. Home sellers starting hiring Realtors at a higher rate. As a side note, I would discount the data recorded prior to 2000, as many Realtors in Tallahassee had not embraced the computerized MLS and many of the home sales were never entered. Today, I believe more than 90% of Realtor sales reach the MLS, even if just to report a sale that has already occurred. 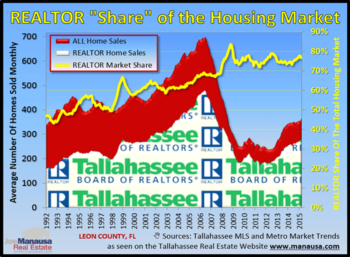 We have been reporting that the market is rising in Tallahassee, but that does not always mean that Realtors are (each) selling more homes. As the market improves, more people activate their license and join a real estate company in Tallahassee. When the market toughens, we typically see the sales force reduced. In the graph below, two separate trend lines are shown (trend line means each point on the graph represents 12 months of information as an average). The blue bars show the average number of Realtors in Tallahassee over the past twelve months (measured on the left vertical axis), while the red line shows the average number of homes sold each year per Realtor (measured on the right vertical axis). The number of Realtors in Tallahassee is on the rise, as there were (on average) 1,157 Realtors in Tallahassee over the past twelve months and the current number is above 1,200. On average, they sold six homes each, double the amount reported in 2009 but roughly 70% of the high reported back in 2001. With the market improving and per-person productivity on the rise, I would expect the second part of 2015 and all of 2016 to be big months for new agents entering the business (as well as many older agents returning to the market). One thing that does not change with market cycles is the need for consumers to interview Realtors when it comes time to buy or sell a home in Tallahassee. Roughly 2/3rds of all new home sellers hire the first agent with whom they speak, and they often regret not doing some research before committing to pay a Realtor tens of thousands of dollars. If you think you might be ready to move, whether you have a home to sell or not, just drop me a note and we will set up a time for you to evaluate the many ways that we can save you money.